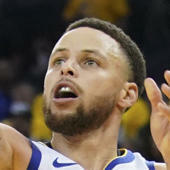 Curry tallied 18 points (7-9 FG, 4-6 3Pt, 2-2 FT), three steals, one rebound, and one assist in 22 minutes during Tuesday's 113-108 victory over the Kings. Curry scored a season-high 18 points Tuesday, just the fifth time he has ended in double-digits this season. He has moved ahead of Nik Stauskas in the rotation and is now typically one of the first players off the bench. He remains more of a deep league option at this stage but if he can find some rhythm, he could be streamed in across standard formats.